Chef Ray Garcia, creator of award-winning Fig Restaurant at the Fairmont Miramar Santa Monica, has quietly earned a position among the best in the Los Angeles restaurant scene. After enrolling at the California School of Culinary Arts, Garcia gained invaluable experience working at the five-star, five diamond Peninsula Beverly Hills, and later with local – and global – culinary giants like Douglas Keane of Cyrus. 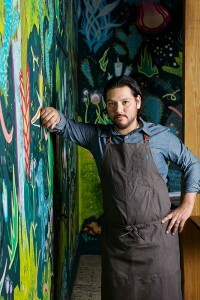 Drawing from the wealth of Southern California produce, and his classic European background, he offers a focused style that uniquely reflects his perspective on accessible fine dining. Garcia’s newest endeavor, BS Taqueria, and forthcoming Broken Spanish will feature authentically inspired innovative fare that represents a city of migrant-rich flavors through the lens of a native Angeleno. Photo credit Dylan + Jeni.